Vision Arkitekter has been inspired by the durability, ecology and beauty of CUPACLAD™ for the design of a family house in Aarhus, Denmark. 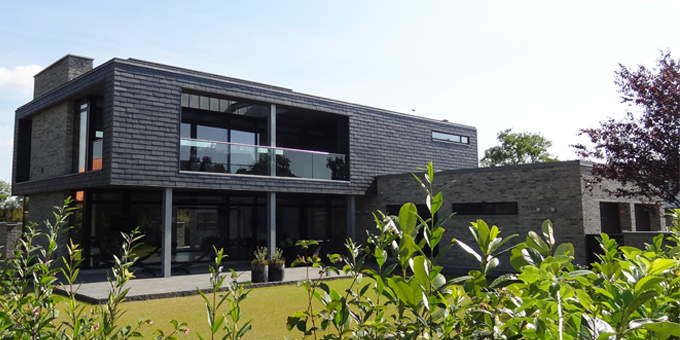 Villa Risskov is a modern and functional project of CUPACLAD™ 101, a ventilated and invisible facade system with CUPA PIZARRAS natural slate. The unique facade of this building, located on the east coast of the Jutland peninsula, was combined with Petersen water-struck and coal fired bricks. The volume of the construction recreates a black block with large windows, which enable more natural light. CUPACLAD™ 101 has been installed using an invisible fixing system. The slate is fixed horizontally with two stainless steel screws. The heads of the screws are under the lap and remain invisible. 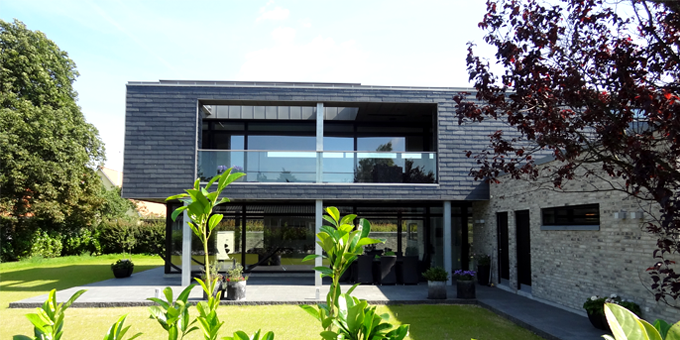 CUPACLAD™ makes possible the installation of natural slate with horizontal orientation, offering new design possibilities for contemporary architecture. Lightweight and easy to install, this construction system helps to create a modern building appearance. In new constructions and in renovation works, CUPACLAD™ systems can be adapted to every architectural design. Built in 2012, Villa Risskov is characterized by quality materials to emphasize the minimalist look of the house. This unique family home -simply in design, powerful in expression and totally functional- creates a timeless design, based on traditional Danish architecture. 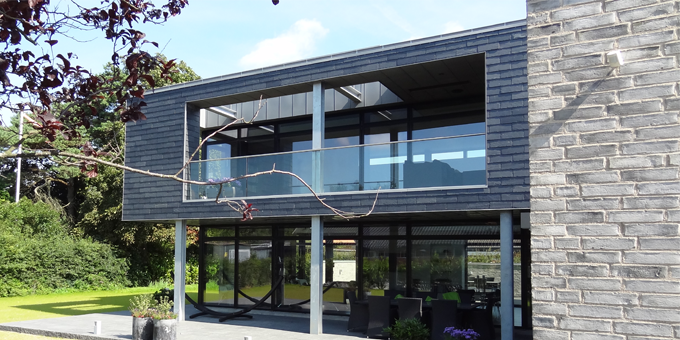 The innovative application of CUPACLAD™ systems in the main facades of the project is a more durable option, thanks to the use of a natural product such as slate, maintaining its noble appearance. The resistance and durability of materials are one of the most highly demanded qualities in all types of building. CUPA PIZARRAS natural slate is fixed on horizontal battens with different fixing elements. The horizontal battens are fixed over the vertical battens, which are mechanically fixed to the facade, allowing a ventilated cavity. In this project, CUPACLAD™ is a timeless method of creating natural slate facades and taking advantage of its properties: durability, ecology and beauty. For more information, visit CUPACLAD website. Photos courtesy of Vision Arkitekter.